$25 off $100 Makita orders. From November 1, 2016 through December 31, 2016, get $25 off select $100 Makita orders shipped and sold by Amazon (not a 3rd party seller). The discount automatically applied at checkout. 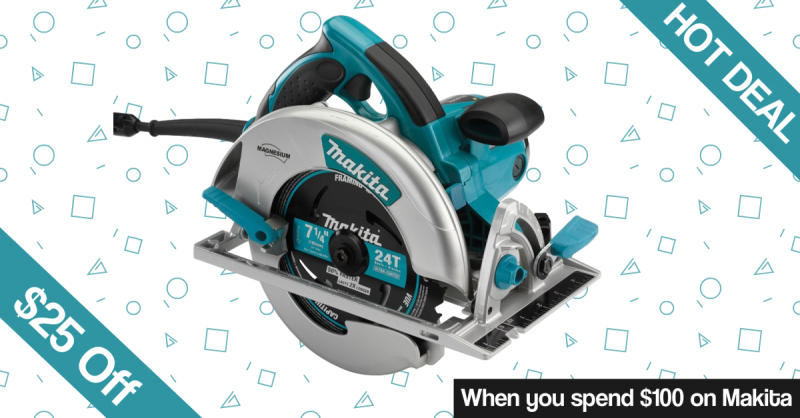 The deal is limited to select Makita products, but there are quite a few of them available in the offer. According to my count over 3,000 Makita products qualify. The best thing about this deal is that you can mix and match products. So if a product doesn't reach the $100 minimum you can also add a filler like drill bits, saw blades, or sandpaper.